Notes covering OpenAM prerequisites, fixes, known issues. OpenAM provides open source authentication, authorization, entitlement, and federation software. OpenAM 13.5.2 is a maintenance release that introduces functional improvements, changes, and fixes to OpenAM. OpenAM 13.5.1 is a maintenance release that introduces functional improvements, changes, and fixes to OpenAM. Licensing changes to the Berkeley DB Java Edition (JE) mean that there is now a single distribution for OEM and Enterprise customers, which is based on Berkeley DB JE. There is no longer a separate OEM version of the product. OpenAM 13.5 introduces a new authentication option that uses push notifications alongside an updated ForgeRock Authenticator app. The ForgeRock Authenticator app can now respond to push notifications for multi-factor authentication, including a passwordless login mechanism. For more information, see "About Push Authentication" in the Administration Guide. New Elliptic Curve Digital Signature Algorithms. OpenAM 13.5 introduces Elliptic Curve Digital Signature Algorithm (ECDSA) support for signing OpenID Connect id_tokens and stateless session tokens. ES256 - ECDSA using SHA-256 hashes and the NIST standard P-256 elliptic curve. ES384 - ECDSA using SHA-384 hashes and NIST standard P-384 curve. ES512 - ECDSA using SHA-512 hashes and NIST standard P-521 curve. You can generate public and private keys for these algorithms using keytool. For more information, see "Configuring Elliptic Curve Digital Signature Algorithms" in the Administration Guide. Default JCEKS Keystore. OpenAM now uses a JCEKS keystore as its default keystore. User self service requires two key aliases: one for signing and one for encryption. OpenAM's JCEKS keystore comes with two default test aliases that can be used for out-of-the-box configuration that should be used for demo purposes only. For upgrades to OpenAM 13.5, the keystore remains the same as previously configured. For example, if you had a JKS keystore configured, the keystore configuration remains as JKS after upgrade to OpenAM 13.5. You will need to reconfigure the keystore to JCEKS on OpenAM 13.5. For more information, see "Configuring the Signing and Encryption Key Aliases" in the Administration Guide. New Trust Transaction Header System Property. OpenAM supports the propagation of the transaction ID across the ForgeRock platform, such as from OpenDJ or OpenIDM to OpenAM, using the HTTP header X-ForgeRock-TransactionId. You can set a new property org.forgerock.http.TrustTransactionHeader to true, which will trust any incoming X-ForgeRock-TransactionId headers. By default, the org.forgerock.http.TrustTransactionHeader is set to false, so that a malicious actor cannot flood the system with requests using the same transaction ID header to hide their tracks. For more information, see "Configuring the Trust Transaction Header System Property" in the Administration Guide. OpenAM 13.5 now supports a new /oauth2/idtokeninfo endpoint for OpenID Connect 1.0 (OIDC) id_token validation. The feature allows clients to offload validation of an OIDC token to the endpoint and to retrieve the claims contained within the id_token directly without accessing the datastore. For more information, see "Endpoint for Validating OpenID Connect 1.0 ID Tokens" in the Developer's Guide. OpenAM 13.5 now supports stateless OAuth v2.0 token blacklisting. For more information, see "Configuring Stateless OAuth 2.0 Token Blacklisting" in the Administration Guide. For more information, see "Stateless OpenID Connect 1.0 Access and Refresh Tokens" in the Administration Guide. 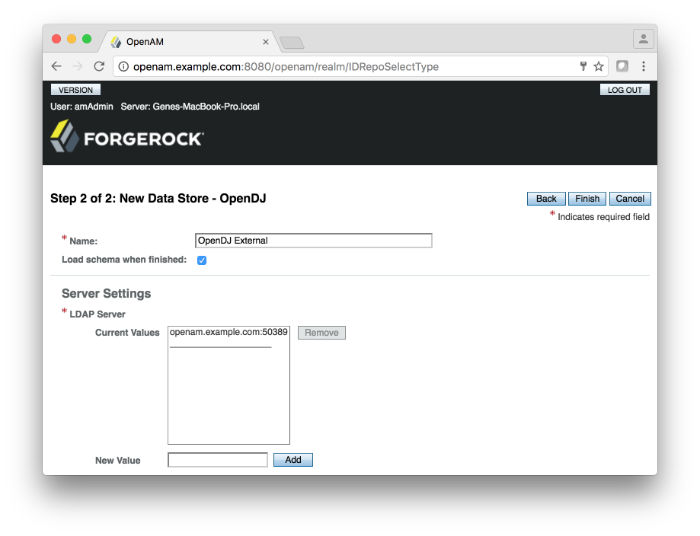 New Field in OAuth2/OIDC Agent Settings: com.forgerock.openam.oauth2provider.jwks. OpenAM 13.5 has been updated with a new field in the OAuth v2.0/OIDC agent setting to specify a static JWKSet value: com.forgerock.openam.oauth2provider.jwks. This setting will allow the Public Key Selector to accept JWKS rather than JWKs_URL. For more information, see "Configuring OAuth 2.0 and OpenID Connect 1.0 Clients" in the Administration Guide. OpenAM 13.5 now supports the ability to encrypt OIDC ID tokens. Administrators can now enable encryption in the OpenAM console. For more information, see "Encrypting OpenID Connect ID Tokens" in the Administration Guide. OpenAM 13.5 supports the ability for an application to obtain the public key used to digitally sign the access and refresh tokens from OpenAM via HTTP. Applications can use the /oauth2/connect/jwk_uri endpoint to obtain the public key to sign the access and refresh tokens from OpenAM. The application can then validate an OAuth v2.0 stateless token without contacting OpenAM. For more information, see "To Obtain the OAuth 2.0/OpenID Connect 1.0 Public Signing Key" in the Administration Guide. On the OAuth2 Provider settings, enable the Allow clients to skip consent option. On the OAuth 2.0 Client (agent) settings, enable Implied consent. When both settings are configured, OpenAM treats the requests as if the client has already saved consent and will suppress any user consent pages to the client. For more information, see "Allowing Clients To Skip Consent" in the Administration Guide. OpenAM 13.5 now provides a Store Ops Token option to generate and store a sign out token in the CTS store for an OIDC provider. When the property is disabled, OAuth 2.0 performance may be improved by not storing the sign out tokens in the CTS store. For more information, see "OAuth2 Provider" in the Reference. OpenAM 13.5 has optimized the sequence to generate an /oauth2/OIDC token (for example, SSO login, oauth2/authorize, access_token with authz code). OpenAM 13.5 now uses LDIF replace instead of a delete/add combination for single valued attributes in OpenDJ. This feature improves performance, requiring less processing in OpenDJ. In OpenAM 13.5, the Services and Global configuration screens in the OpenAM console have migrated to the new XUI interface. OpenAM 13.5 has enhanced its ssoadm command to support policy export and import to JSON. For more information, see "To Export Policies in JSON Format (Command Line)" in the Administration Guide. Enhancements to the ForgeRock Common Audit Framework allow OpenAM 13.5 to log user and administrative activity to Elasticsearch and JMS. For more information about the Elasticsearch audit event handler, see "Implementing Elasticsearch Audit Event Handlers" in the Administration Guide. For more information about the JMS audit event handler, see "Configuring JMS Audit Event Handlers" in the Administration Guide. OpenAM adds a new OAuth 2.0 stateless access token claim, "grant_type". "grant_type". The "grant_type" claim indicates the type of authorization flow that the user has completed. This information is useful for the resource server to make decisions based on both the scopes and the grant type of the user. OpenAM now provides a configuration option to set the number of failed retry attempts for HMAC-based One-Time Password (HOTP), ForgeRock Authenticator, and Oath modules. The default is 3 failure attempts. The minimum number is 1 and the maximum number of retries is 10. OpenAM now allows clients other than the one issued the token to use the token introspection endpoint (/introspect endpoint. You can add a new scope, am-introspect-all-tokens to grant access to clients to introspect all tokens using the OAuth 2.0 introspection endpoint. The WS-Federation attribute mapper now checks the attribute mapping configuration from the remote service provider (SP) first, and if it was present, uses that instead of a identity provider attribute mapping configuration. This WS-Federation configuration change allows it to function in a similar manner as the SAML2 attribute mapping solution. Previously, OpenAM would log a stack trace in the Session debug file when making a call to the /json/sessions endpoint with the validate action and passing in a token whose related session is invalid. The message level has been changed from ERROR to MESSAGE, which no longer results in a stack trace in the logs. Previously, OpenAM used application/x-www-form-urlencoded-based encoding from com.sun.identity.shared.encode.URLEncDec for HTTP request query parameters. This often led to issues when using proxies, such as OpenIG that apply strict RFC decoding and encoding routines. OpenAM now uses org.forgerock.http.util.Uris from the Commons library, which provides encoding and decoding methods for both application/x-www-form.urlencoded and query parameters. OpenAM now stores less metadata in the CTS when the server uses Stateless OAuth 2.0 tokens. This improvement does not render any existing OAuth 2.0 tokens invalid. When you upgrade an OpenAM server, the upgrade process enables Stateless Grant Token upgrade compatibility mode. This mode allows the CTS to store both former and current formats of Stateless OAuth 2.0 token metadata. The mode enables you to benefit from the improvement when performing a rolling, zero-downtime upgrade of an OpenAM cluster. In OpenAM console, under Configure > Global Services > OAuth2 Provider, disable Stateless Grant Token upgrade compatibility mode, and save the change. OpenAM can now connect to multiple master directory server instances, with each instance acting as the master for a subset of CTS tokens. In this architecture, CTS tokens are described as having an affinity for a given directory server instance. Versions of OpenAM that do not support session affinity require the CTS token store to be deployed in an active/passive architecture, which limits OpenAM's connection to the CTS token store to a single master instance with failover instances. In this release, the CTS token store can still be deployed in an active/passive architecture. For more information, see OAuth 2.0 and OpenID Connect 1.0 Client Configuration Fields in the Administration Guide. OpenAM 13.5.1 now supports signing and encrypting UserInfo responses as per the OIDC spec. For more information, see "OAuth 2.0 Mix-Up Mitigation" in the Administration Guide and "Hints for the OAuth 2.0/OpenID Connect Authentication Module" in the Administration Guide. The user self-registration flow has been improved so the email validation occurs after the user has provided their details. For more information, see "To Register a User with the REST APIs (13.5.1 or later)" in the Developer's Guide. This chapter covers installing and upgrading OpenAM 13.5.2-11 software. If you are upgrading from OpenAM 13.0 to OpenAM 13.5 and want to configure Push Authentication with your external data store, you must manually apply the schema update to the data store by enabling the load schema when finished in the OpenAM console. You can set the property on the OpenAM console by navigating to Top Level Realm > Data Stores > New > data store type. In a clean OpenAM 13.5 installation, you must manually update the schema using the opendj_pushdevices.ldif if you want to use Push Notifications. The opendj_pushdevices.ldif is located in /path/to/tomcat/webapps/openam/WEB-INF/template/ldif/opendj  folder. To manually update the schema, see Updating Directory Schema in the OpenDJ Administration Guide for instructions. For additional information about upgrading OpenAM, see the Upgrade Guide. There are analogous pushdevices.ldif files for Active Directory in the /path/to/tomcat/webapps/openam/WEB-INF/template/ldif/ad folder; Oracle DSEE in the /path/to/tomcat/webapps/openam/WEB-INF/template/ldif/odsee folder; Tivoli in the /path/to/tomcat/webapps/openam/WEB-INF/template/ldif/tivoli folder. For instructions to update the schema, see the respective directory server documentation. The WS-Federation attribute mapper now checks the attribute mapping configuration from the remote service provider (SP) first, and if it was present, uses that instead of a hosted identity provider (IDP) attribute mapping configuration. The property controls the size of the SubjectEvaluationCache. The default value is 10000. For more information, see "Core Token Service (CTS) Object Identifiers" in the Reference. Previously, sending both HTTP Basic Auth credentials and the client_id property, without including the client_secret, returned: ERROR: Client (client) using multiple authentication methods. This is in accordance to RFC 6749, section 2.3.1, which states that a client MUST only send a single form of authentication. However, passing client_id in the message body, but not client_secret, does not constitute credentials and therefore is now permitted. User Self-Service Now Respects the Locale Parameter in HTTP Requests. User self-service emails are now returned displaying the requested locale attributes configured within user self-service. Improved Audit Logs for Not Found Failures. The failure reason is now printed in audit log for "User Not Found" cases. The logic for checking whether a user is active or not should now fail if the user is inactive in any of the configured user stores. Cookie Domain Defaults to FQDN. When adding another server to an existing OpenAM 13.5.0 deployment using the GUI configurator, the cookie domain in the OpenAM setup wizard sets the cookie domain to be the full URL that was used to access the configurator, such as example.com. For more information, see OPENAM-9369. SAML 2.0 NameID Persistence Extended. OpenAM's SAML 2.0 account management and NameID persistence logic was updated to work better with non-persistent NameID formats in OpenAM 13.0.0. It has now been extended to have persistence completely controlled by the hosted IdP flag (idpDisableNameIDPersistence) and the hosted/remote SP flag (spDoNotWriteFederationInfo). These flags now also control whether the persistent NameID details should be stored in the datastore. This change allows deployments that have a read-only user store shared by the SP and IdP to not store persistent federation information. Setting: idpDisableNameIDPersistence. OpenAM provides a setting, idpDisableNameIDPersistence, which disables the storage of the NameID values for all NameIDs issued by that IdP instance. SP's spDoNotWriteFederationInfo Repurposed. The SP's spDoNotWriteFederationInfo setting has been repurposed. It no longer applies to unspecified NameID-Formats and now allows persistence to be set to NOT store federation info. Method in the IDPAccountMapper Interface. The IDPAccountMapper interface has been extended with a new shouldPersistNameIDFormat method. For more information, see shouldPersistNameIDFormat in the OpenAM API Javadoc. * in the user data store, false otherwise. This implementation first checks whether NameID persistence has been completely disabled at the IdP level (idpDisableNameIDPersistence setting), and if not, it will look at the SP configuration as well (spDoNotWriteFederationInfo setting). For more information, see OPENAM-8580. An example of a service definition compatible with OpenAM 13 can be found in "The Sample Auth Service Configuration" in the Developer's Guide. Legacy deployments should migrate to the new user self-service features in OpenAM 13.5.2-11, see "Configuring User Self-Service Features" in the Administration Guide. To restore the legacy endpoints, enable the Configure > Global Services > Legacy User Self Service > Legacy Self-Service REST Endpoint option. For instructions on how to expand the openam.war file, make changes to bootstrap.properties file, and then rebuild the openam.war file, see "To Prepare OpenAM for JBoss and WildFly" in the Installation Guide. This change affects OAuth v2.0 scope validator plugins. For more information, see "Customizing OAuth 2.0 Scope Handling" in the Developer's Guide. In OpenAM 13.5.2-11, this is no longer possible. You must deploy the OpenAM configuration store in an OpenDJ server instance: either the embedded OpenDJ directory server instance that is installed together with OpenAM, or in an external server instance. The steps to install and configure a Java Fedlet have changed. In previous versions, the Create Fedlet wizard included the federation configuration in the fedlet.war file, and added the fedlet.war file to the Fedlet.zip file. This is no longer the case, and as a result, the steps you perform to install and configure a Java Fedlet have changed. For updated steps to install and configure a Java Fedlet, see "Creating and Installing a Java Fedlet" in the Developer's Guide. Persistent cookies are now encrypted and signed. In previous versions, persistent cookies were encrypted with OpenAM's public RSA key. OpenAM 13.5.2-11 now signs the persistent cookie with a user-specified HMAC signing key in addition to encrypting it. For information about the new HMAC Signing Key property in the Persistent Cookie authentication module, see "Hints for the Persistent Cookie Module" in the Administration Guide. No features have been deprecated in OpenAM 13.5.2. No features have been deprecated in OpenAM 13.5.1. No functionality has been removed from OpenAM 13.5.2. The LDAPS Server Protocol Version and its accompanying property, openam-idrepo-ldapv3-config-secure-protocol-version has been removed from OpenAM 13.5.1. The early access feature of storing identity data in a relation databasehas been removed from OpenAM. This feature was only supported for test and development environments. OpenAM does no longer implement section 2.1 of the JSON Web Token Profile for OAuth 2.0 Client Authentication and Authorization Grants. Network Security Services for Java (JSS) has been removed from OpenAM. As a result, OpenAM no longer provides native support for Federal Information Processing Standard (FIPS) mode. OpenAM's implementation of OAuth v1.0 has been removed. The Administration Service has been removed. OpenAM issues are tracked at https://bugster.forgerock.org/jira/browse/OPENAM. This chapter covers the status of key issues and limitations at release 13.5.2-11. OPENAM-11263: Improve Embedded DJ logging to pick up replication configuration errors. OPENAM-11564: Ops is always created, even if the option "Store Ops Tokens" is disabled. OPENAM-11987: SmsServerPropertiesResource removes password when unchanged. OPENAM-12002: The mutiple entries in "Primary LDAP Server" for Policy Configuration must be a single line. OPENAM-12319: Memory leak in accessing Jato Pages. OPENAM-5542: ServiceConfigImpl causes memory leak. OPENAM-9443: "ID Token Signing Algorithms supported" values are missing in OAuth2 service after upgrade. OPENAM-9482: The provided Access Control Instruction (ACI) target expression DN value "dc=openam,dc=forgerock,dc=org" is invalid. OPENAM-9610: XUI login page fails on first load using iOS with "Unknown error. Please contact your administrator." OPENAM-9885: Oauth2 load: Tomcat keeps logging "WARNING: Addition of the standard header "Pragma" is discouraged as a future version of the Restlet API will directly support it." OPENAM-10087: Set of character for user code in OAuth2 device flow should not contain confusing characters (such as 0 and O). OPENAM-10165: User self service does not respond on locale parameter in http request. OPENAM-10336: oauth2/connect/register expecting a String instead of a Json for the jwks field. OPENAM-10931: IdentitySubject not adding isMember() result to cache after entry has changed. Realm Creation Not Working using Internet Explorer 11. Realms cannot be created when using Internet Explorer 11 due to an IE scripting configuration. Workaround: Use another browser, such as Google Chrome, when creating realms. JCEKS Keystore Support for User Self-Services. In OpenAM 13.0.0, OpenAM's user self-service feature is stateless, which means that the end-user is tracked and replayed by an encrypted and signed JWT token on each OpenAM instance. It also generates key pairs and caches its keys locally on the server instance. OpenAM 13.5 solves this issue by providing a JCEKS keystore that supports asymmetric keys for encryption and symmetric keys for signing. Users who have installed OpenAM 13.0.0 and enabled the user self-service feature will need to run additional steps to configure a JCEKS keystore to get the user self-service feature operating after an upgrade to OpenAM 13.5. Note that for users of the IBM JDK on Websphere must generate their own JCEKS keystore to replace the default installation. Currently, the IBM JDK cannot load a JCEKS keystore created from a Sun/Oracle JDK on Websphere. For specific instructions to configure the JCEKS keystore, see "Configuring the Signing and Encryption Key Aliases" in the Administration Guide. Users upgrading from versions prior to OpenAM 13.0 are not impacted. Users who upgrade from OpenAM 13.0 and do not enable the user self-services feature are not impacted. Users who do a clean install of OpenAM 13.5.1 are not impacted. OPENAM-12302: Improve error response for Device Code flow - missing user code. If you have found issues or reproducible bugs within OpenAM 13.5.2-11, report them in https://bugster.forgerock.org. Added a new OAuth 2.0 access token claim, "grant_type". For more information, see OpenAM 13.5.2. Removed references to the Federation Connectivity Test, which no longer exists. Added a warning about enabling the org.apache.tomcat.util.buf.UDecoder.ALLOW_ENCODED_SLASH. For more information, see "Preparing Apache Tomcat" in the Installation Guide. An OAuth 2.0 provider URL, /oauth2/customers/access_token, was fixed in the documentation. For more information, see "OpenAM OAuth 2.0 Endpoints" in the Administration Guide. Variables in the access log reference were updated. For more information, see "Access Log Format" in the Reference. The OpenAM Installation Guide was updated with the removal of a section on Oracle WebLogic 11g, which is not supported. The OpenAM Administration Guide was updated with emended text about using external log rotation tools for the audit logs. The audit logs do not support external log rotation tools. For more information, see "About the Audit Logging Service" in the Administration Guide. The Release Notes were updated to show REST endpoints that were removed from OpenAM 13.5. They were incorrectly listed under the "Deprecated Functionality" section. For more information, see the "Removed Functionality" section in the OpenAM 13.5 Release Notes. The MIB to monitor policy evaluation performance over SNMP was corrected. For more information, see "SNMP Monitoring for Policy Evaluation" in the Administration Guide. The diagram for CDSSO was updated with a corrected steps (20, 21, and 22). For more information, see "Configuring Cross-Domain Single Sign-On" in the Administration Guide. A new property, org.forgerock.policy.subject.evaluation.cache.size was added. It controls the size of the SubjectEvaluationCache cache. For more information, see "Advanced" in the Reference. The LDAPS Server Protocol Version property openam-idrepo-ldapv3-config-secure-protocol-version is no longer available. The step to import cts-add-multivalue.ldif was removed from the Installation Guide. The file does not apply to this version of OpenAM. For more information, see the "Import CTS Files" in the Installation Guide. Created 13.5.1 specific sections in the Release Notes for additional information about the release. Removed the .NET Fedlet section from the documentation. For more information, see "Important Changes to Existing Functionality". Added a step to restart OpenAM or the container where it is installed when performing a silent upgrade, in "To Upgrade From a Supported OpenAM Version" in the Upgrade Guide. Updated the Session Token Validation section with additional information about specifying the session token in the header. For more information, see "Validating Sessions" in the Developer's Guide. Expanded information about the Profile Attribute Name property under the Adaptive Risk Authentication Module. For more information, see "Hints for the Adaptive Risk Authentication Module" in the Administration Guide. Added information about ForceAuth=true use case when configuring the Windows Desktop SSO Authentication Module. For more information, see "Hints for the Windows Desktop SSO Authentication Module" in the Administration Guide. Expanded information about implementing post-authentication plugins. For more information, see, "Post-Authentication Plugins" in the Administration Guide. Added information about OpenAM requiring cookies for configured realms when using DNS aliases. For more information, see "Configuring Realms" in the Administration Guide. Updated the information about how to create policy sets using the console to match the XUI style, and the output returned from the endpoint. For more information, see "To Configure a Policy Set Using the OpenAM Console" in the Administration Guide and "RESTful Authorization and Policy Management Services" in the Developer's Guide. The /oauth2/access_token endpoint can take an additional parameter, auth_chain=authentication-chain. For more information, see "OAuth 2.0 Client and Resource Server Endpoints" in the Developer's Guide. Updated the procedure to import the CTS schema into an external data store with steps for OpenDJ 3.5 and 4.0. For more information, see "To Import the CTS Configuration" in the Installation Guide. Updated the description of the Blacklist Poll Interval property required when configuring stateless OAuth 2.0 token blacklisting. For more information, see "To Configure Stateless OAuth 2.0 Token Blacklisting" in the Administration Guide. Added RFC links for OAuth 2.0 token revocation and for the JWT profile for OAuth 2.0 client authentication and authorization grants. For more information, see "Supported Standards" in the Reference. Updated the path to the .mib files specified for monitoring CTS tokens using SNMP. For more information, see "Monitoring CTS Tokens" in the Administration Guide. Added information about setting valid got URLs over REST. For more information, see "REST Goto URL Validation" in the Developer's Guide. Updated the description of the advanced server property com.sun.embedded.sync.servers. For more information, see "Advanced" in the Reference. The openam.auth.soap.rest.generic.authentication.exception advanced property was removed in OpenAM 13 with several /identity/ endpoints but was still mentioned in the OpenAM Administration Guide. This mention has been removed. Added information about the way OpenAM determines the redirection URL, basing the decision on authentication success or failure. For more information, see "Redirection URL Precedence" in the Administration Guide. Added a list of endpoints deprecated in OpenAM 13.5 release that were incorrectly flagged as removed in OpenAM 13. For more information, see OpenAM 13.5.0. Updated information about usage of post-authentication plugins. For more information, see "Configuring Your Post Authentication Plugin" in the Developer's Guide. User self-registration flow was updated in 13.5.1. For more information about the new flow using the REST APIs, see "To Register a User with the REST APIs (13.5.1 or later)" in the Developer's Guide. Revised and clarified "To Set Up Administration Tools" in the Installation Guide. Corrected the example Elasticsearch index in "To Prepare for Elasticsearch Audit Logging" in the Administration Guide. Elasticsearch indexes must be all lower case, and the example had an index with some upper case characters. Corrected the description of the Mobile Carrier Attribute Name in "Hints for the HOTP Authentication Module" in the Administration Guide. Added a new section, "Managing Scripts With the ssoadm Command" in the Administration Guide, which provides ssoadm command examples of script management. Revised "Preparing Oracle WebLogic" in the Installation Guide, to provide additional guidance for deploying OpenAM into WebLogic and removed outdated information. There is now a new section with steps to perform before deploying OpenAM in WebLogic. Modified example paths in "To Prepare an External OpenDJ Identity Repository With Manual Schema Updates" in the Installation Guide that could lead to confusion. Corrected the example SSL connector in "To Set Up OpenAM With HTTPS and Self-Signed Certificates" in the Administration Guide to add the keystoreType property and to update the protocol property to the default used by Apache Tomcat8.x. Corrected and clarified the steps to change the amadmin user's password in "Administering the amadmin Account" in the Administration Guide. The section now contains a procedure to change the amadmin user's password when the configuration store is in the embedded OpenDJ server, and another procedure to change the password when the configuration store is in an external OpenDJ server. Revised "Managing Certificates and Keystores" in the Administration Guide to provide more information about key aliases and keystores in OpenAM. Added new procedures to configure the keystore and to change the user self-service key aliases. The procedure to change the signing key is also updated. Updated the documentation set to reflect that OpenAM 13.5 defaults to JCEKS keystore instead of to JKS keystore. Revised and clarified "Backing Up and Restoring OpenAM Configurations" in the Administration Guide. Updated "Localization" in the Reference to include XUI localization support information. Updated the file descriptor section with some additional instructions for daemon processes. See "Setting Maximum File Descriptors" in the Installation Guide. Updated the Configuring the Core Token Service with small fixes to the instructions in "Configuring the Core Token Service" in the Installation Guide. Updated the list of distribution files in the OpenAM Deployment Planning Guide in "OpenAM Server Overview" in the Deployment Planning Guide. Removed the com.sun.am.event.connection.idle.timeout from the OpenAM Reference Guide. Added a link to create a configuration store backend in "To Custom Configure OpenAM" in the Installation Guide. Added ability to use UTF-8 encoded user names and passwords during REST authentication. See "Authentication and Logout" in the Developer's Guide. Added Microsoft Edge to the list of supported browsers, and changed references in the documentation from "Internet Explorer" to "Internet Explorer and Microsoft Edge." Revised the chapter on CTS OIDs to include the OIDs' data types, and corrected several entries in the CTS OIDs diagram. See "Core Token Service (CTS) Object Identifiers" in the Reference. Updated Active Directory Hints section to indicate that cn gets its value from the uid or username and sn gets its value from givenName in "Hints for Configuring Active Directory Data Stores" in the Administration Guide. Updated the HMAC One-Time-Password (HOTP) hints with a note about configuring login page session timeouts in "Hints for the HOTP Authentication Module" in the Administration Guide. Updated the information on cookie domain values, which can now be empty strings for host-only cookies or any non-top level domain in "Preparing a Fully Qualified Domain Name" in the Installation Guide. Initial release of OpenAM 13.5.0.